Is a sort of antioxidants able to suppress the adverse effects of all active oxygen species? 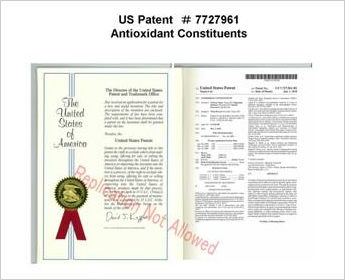 We have conducted experiments to examine whether naturally-occurring antioxidants in food are able to prevent active oxygen from degrading proteins or the DNA of genes. Active oxygen causes protein degradation. When it occurs, the black protein bands disappear, as shown in the pictures. 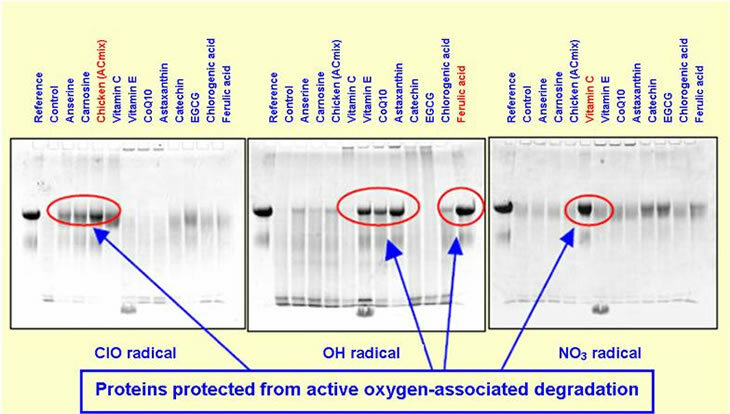 If an antioxidant is added to food to suppress active oxygen-associated degradation, protein bands will be protected, and remain clearly present. As these pictures show, no single antioxidant among those tested was able to suppress every one of the different types of active oxygen species. The most potent antioxidant effect on active oxygen formed through hypochlorite-mediation was found in imidazole dipeptide (anserine and carnosine), which are animal-derived antioxidants in chicken and tuna extracts. Such effect on hydroxyl radicals and peroxynitrite active oxygen species were found in ferulic acid and carotenes in grains and vegetables, and in vitamin C in fruits, respectively. Experiments to investigate the suppression of DNA degradation have found that imidazole dipeptide (anserine and carnosine) inhibit hydrogen peroxide-induced oxidation, as in the case of hypochlorite-associated oxidation. Interestingly, in this case, vitamin C acts to promote the hydrogen peroxide-induced degradation. These results suggest that, when taking antioxidants to control ageing by preventing cell death caused by active oxygen, it is not adequate to take a single antioxidant or those of the same type, but it is important to take a well-balanced combination of antioxidants, much like nutrient intake. Based on the results of this research, we have filed patent applications in Japan, the United States, and Taiwan, with approval already granted in the latter two countries. 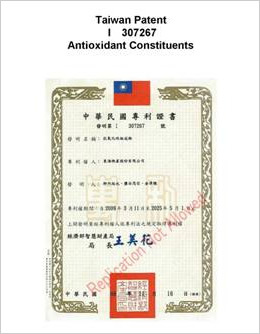 while the Taiwan patent has been obtained on an antioxidant constituents that contains 20-100 mg of vitamin C and 2-8 mg of caffeic acid analogs, including ferulic acid, or coenzyme Q10 per 100 mg of an anserine-carnosine mixture or reduced glutathione (Taiwan Patent I307267). Copyright © 2013 TOKAI BUSSAN All Rights Reserved.